This Instant Pot turkey chili makes a hearty meal that's sure to take the chill off on the coldest fall and winter days. Ground turkey makes the chili lower in saturated fats and calories and it's an excellent choice if you're trying to cut down on red meat. Ground turkey breast is the leanest, but ground turkey thighs or a combination of both white and dark meat will give you the best flavor and texture. Chili is highly adaptable. If you enjoy hot and spicy dishes, add extra jalapeño peppers, a finely chopped Fresno pepper, or a few serrano peppers. A teaspoon or more of cayenne pepper or crushed red pepper flakes will also help add heat. Or, if you prefer a milder dish, swap out the hot peppers for milder ones like Anaheim, Ancho, Poblano, or New Mexico. Thanks to the the pressure cooker, this chili tastes so rich and delicious, your friends and family will think it simmered on the stovetop for hours. You don't have to tell anyone it cooked for only 35 minutes. Plan on an extra 20 to 30 minutes for pressure buildup and release. Add 1 tablespoon of olive oil to the Instant Pot and choose the sauté setting. Add the chopped onion, bell pepper, and shredded carrots and cook, frequently stirring, for about 4 minutes or until the vegetables are softened. Remove the vegetables to a plate and set aside. Add the remaining 1 tablespoon of olive oil to the pot along with the ground turkey. Cook, stirring, until the turkey is no longer pink. Add the chopped jalapeño peppers and garlic and cook for 1 minute longer. Add the onion, bell pepper, and carrot back to the pot along with the Worcestershire sauce, chili powder, cumin, and pepper. Stir to blend. Add the tomatoes, undrained beans, and chicken stock to the pot. Stir to blend. Lock the lid in place and make sure the knob is in the "sealing" position. Choose the manual setting, high pressure, and set the timer to 20 minutes. When the time is up, let the pressure release naturally for 15 minutes. 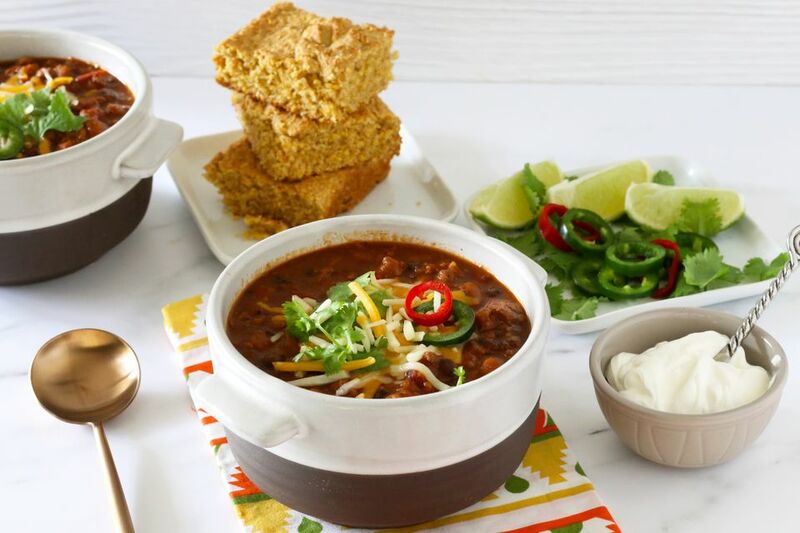 Enjoy the big bowl of chili with freshly baked cornbread and your favorite toppings. Croutons, shredded cheese, sour cream, cilantro leaves, and chilies are excellent garnish options. If the chili is thinner than you like, add a tablespoon or two of cornmeal or a few tablespoons of tomato paste and let it simmer on the saute setting for an extra 5 minutes. Chili freezes beautifully! Make a double batch and freeze portions for up to 6 months for future meals. For quick defrosting, put the bowl or bag (if airtight) in a larger bowl of hot water for about 10 minutes, or until it can be broken up. Transfer the chili to a large saucepan and add about 1/4 cup of water. Reheat, adding more water, as needed to prevent scorching. Any electric or stovetop pressure cooker can be used to make the chili. Just be sure to follow the manufacturer's recommendations for safety and liquids.